Shocking images overnight of NYC which has put a bit of a scare up us both as to what we will find if and when we get back to the Big Apple on Friday! We also have received advice from Delta that doesn’t fill us with a huge amount of confidence ie that we may not make our connection from Toronto to Halifax – not quite sure what that means but if our experience on Monday is anything is to go by, nothing can be guaranteed in the airline industry here. So you can see that we are in a bit of limbo at the moment. We will try to contact Delta later to see what is the story and if there is likely to be a problem we may hang tight in Boston – go and see some of the sights here and then try to make our way back to NYC by plane or train. Certainly been an adventure to date! In the meantime we are heading to the gym shortly to try to work off a bit of the frustration and have a clear head to deal with the next phase. Importantly, we are fortunate that we were not in NYC overnight. It would have been a very frightening experience and we are both thankful that we had this Canadian leg organised as the first part of our journey. Queens, which is where we stayed on our first night in NYC, was fairly badly hit and had our travels brought us to the US on the night that #Sandy decided to pay a visit, who knows what would have happened? 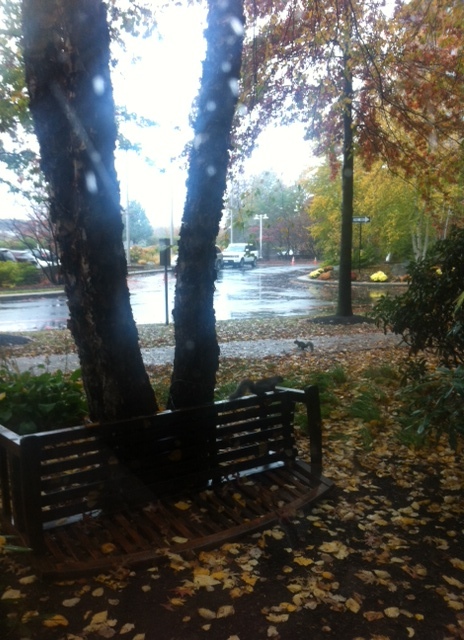 Even the squirrels are scurrying for cover- just outside our Boston digs.